One of the dominant global leaders in electronics, Sony music products are all about reliable performance and functional design, built with durable high-quality materials and components. 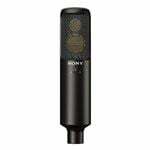 Sony music accessories provide professional level audio quality for all types of studio, live performance, and production applications. Rating (53) 4.5 out of 5 stars. 53 ratings. American Musical Supply is excited to be your stop for Sony electronics! We offer True 0% interest payment plans – applying is easy and there is no credit check for our 3-pay plan on purchases from $49-1,500. Use your own debit or credit card, enjoy fast and free shipping, and add Sony products to your creative setup.